The refreshed Mercedes-Benz GLC-Class arrives offering buyers a premium crossover with a slightly different look and a whole lot more tech. The updated model debuts to the public at the Geneva Motor Show and goes on sale in Europe in the middle of the year. Americans have to wait until late 2019. From the outside, the updated GLC-Class looks pretty familiar. The grille wears fluted inserts that add some visual texture to the vehicle's face. The lower fascia now has three, small rectangular sections at the bottom, and the corner intakes are more rectangular. LED headlights are standard, and the lamps have a smaller, more angular shape. At the back, the taillights feature rectangular lamps in them. The integrated exhausts have sharp-edged trapezoidal outline, instead of the existing more curvaceous appearance. The GLC-Class is the latest Mercedes to gain the MBUX system that consists of a digital instrument cluster and infotainment screen in a wide bezel that spans much of the dashboard. New trim choices like Natural Grain Grey Oak and Natural Grain Walnut add a fresher look to the cabin. A revised multi-function steering wheel has new controls for using the updated infotainment system. In the United States, buyers can select between the rear-wheel-drive GLC 300 and all-wheel-drive GLC 300 4Matic. Both of them come with a 2.0-liter turbocharged four-cylinder that makes 255 horsepower (190 kilowatts). A nine-speed automatic is the only gearbox choice for them. In Europe, there are two gasoline-fueled options, and both of them use 48-volt mild-hybrid tech, which doesn't come on the American version. The base GLC 200 4Matic offers 194 horsepower (145 kW), and the GLC 300 4Matic has 255 hp (190 kW). In addition, there are three diesel choices: the GLC 200d 4Matic with 161 hp (120 kW), GLC 220d 4Matic with 192 hp (143 kW), and GLC 300d 4Matic with 241 hp (180 kW). Mercedes also expands the GLC's range of optional equipment. Buyers can get the Dynamic Body Control adaptive dampers for a smoother ride. In addition, the Off-Road Engineering Package adds Off-Road and Off-Road+ driving modes. The Driving Assistance Package adds adaptive cruise control capable of braking to a stop, active steering assist, lane change assist, and route-based speed adaptation. Mercedes will announce pricing for the new GLC-Class closer to launch. However, Motor1.com will get a good look at the crossover because we'll be at the upcoming Geneva Motor Show. Stuttgart. Freedom in its most beautiful form– that is what the GLC has stood for since its launch in autumn 2015. Like its predecessors, the SUV combines outstanding on and off-road driving characteristics with spaciousness, practicality and comfort. In addition, the latest generation adds further advanced pioneering technologies, the distinctive design, connectivity and state-of-the-art infotainment. Thus, the GLC once more demonstrates how elegantly and effortlessly hallmark brand safety and intelligent adaptability can be combined to great success. The result is an SUV that sets new standards, on the road as well as in terrain. With its distinctive appearance, the new operating concept, innovative driving assistance systems and a new range of engines, the GLC offers the best from the world of Mercedes-Benz. The exterior design captivates with the wide and sporty visual appearance. Muscularly sculpted surfaces and distinctive details such as the chrome elements, which now run from the front to the rear end as standard, the redesigned headlamps and the heavily contoured radiator grille ensure a strong off-road character. The interior combines luxury and user-friendliness in an uncompromising way: The workmanship is at the usual high level and the infotainment system has larger touchscreen multimedia displays. In addition, the latest generation of the MBUX - Mercedes-Benz User Experience multimedia system impresses with intuitive and versatile operating options such as touch, gesture control and the optimised voice control system. The driving assistance systems were considerably expanded and complemented with the exit warning function, the emergency corridor function and the tail end of a traffic jam function, among others. Also new is Trailer Manoeuvring Assist, which provides assistance with manoeuvring in reverse in particular. For the market launch in mid-2019, the GLC will be equipped with new petrol and diesel engines of the latest engine family from Mercedes-Benz with more output and greater efficiency – more engines will follow later in the year.  MBUX - Innovative telematics: The combination of the touchscreen multimedia displays, navigation with augmented reality, intelligent voice control via the talk button or the "Hey Mercedes“ prompt, connectivity and the user interface now brings the GLC also in line with the latest technological standards.  Drive system: The GLC will be equipped with the next generation of four-cylinder petrol and diesel engines with increased output at significantly lower fuel consumption – on the petrol engines thanks to the new 48-volt on-board electrical system with belt-driven starter- generator.  Advanced assistance systems: Active Distance Assist DISTRONIC and Active Steer Assist provide even more comfortable support to help the driver to keep a safe distance and steer. The speed is adjusted automatically ahead of bends or junctions. Active Steer Assist helps with forming an emergency corridor and with changing lanes. Modernity, strength and versatility: that is what the design of the GLC embodies. 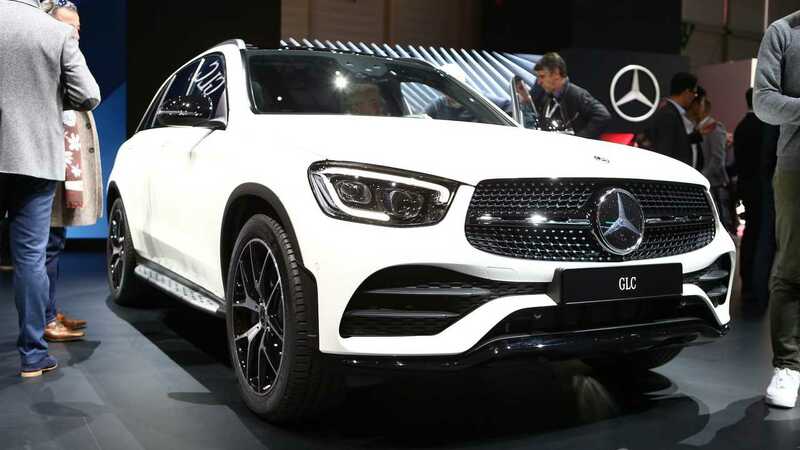 The design idiom of the GLC follows the design philosophy of sensual purity and illustrates the carefully considered interplay of aesthetics, agility and intelligence. The appearance is sportier overall, the chrome elements now run from the front to the rear end as standard. The distinctive lines, muscularly sculpted surfaces and distinctive details ensure a strong off- road character. The front end gives the impression of emotion, presence and dominance at the very first glance. This design message is made particularly memorable by the standard-fit LED High-Performance headlamps with the torch-design daytime running lights, as well as by the heavily contoured radiator grille with the dynamically shaped double louvres and the diamond lattice. The available paint colours now include graphite grey – with four flush aerodynamic wheels with diameters ranging from 17 to 19 inches and tyres with optimised rolling resistance being another new addition. The AMG Line impressively emphasises the dynamic appearance of the GLC – with the chromed diamond grille and the front apron with AMG-specific design as well as with angular exhaust tips integrated into the bumper. In addition to sport seats with high side bolsters, this design and equipment line also includes the optimal mixed-size tyres from 19 to 20 inches in diameter (depending on the market). The multifunction steering wheel is available in two versions and has been completely revised. Its distinctive spoke design conveys even more sporty character. In addition, its operation of Active Distance Assist DISTRONIC and the Touch Control buttons for controlling the instrument cluster and the multimedia system as well as the acoustic input feedback send a clear signal pointing to the future. Arrive relaxed on long journeys: The optional ENERGIZING comfort control ensures that various systems in the vehicle combine forces to create an optimal environment. This integrates lighting and musical atmospheres, climate control, suitable music and video selections as well as massage function, heating and ventilation of the seats. The ENERGIZING COACH uses data from the vehicle and surroundings to recommend one of the programmes that fits the situation and the individual. With the help of a suitable Garmin® wearable, personal scores such as the stress level or the quality of sleep make the recommendation more precise. The information the driver needs are shown on two high-resolution displays. Optionally, the instrument cluster measures 12.3 inches. The free-standing multimedia display in the centre is available in two sizes: Seven inches with a resolution of 960 x 540 pixels and 10.25 inches with 1920 x 720 pixels. The driver can choose from three individual representations to suit the mood or the interior: "Classic“ is an advancement of a classic display, "Sport“ presents a high-contrast high-tech look, "Progressive“ visualises modernity in reduced form. The graphics in brilliant quality underscore the comprehensibility of the intuitive operating structure. New additions are the touch sensitivity of the multimedia display – and the Touch Control buttons on the multifunction steering wheel for operating the instrument cluster and the multimedia system. Another effortless way of operating the multimedia system is the Interior Assistant. A camera in the overhead control panel captures the movements of the hand as it approaches the touchscreen or the touchpad on the centre console. The system makes a distinction between the gestures of the driver and the front passenger, which changes the image on the media display accordingly by highlighting or enlarging individual elements. The reading spot also can be switched on and off by hand control. To this end, the light in the overhead control panel follows the movement when the driver is looking for something on the front passenger seat, for example. In addition, there is the option of operating a favourite function of the multimedia system by a specific gesture that was stored previously. The revised voice control system makes operation even more convenient and natural. By voice command, the driver can have the system read out text messages, operate the audio systems or access vehicle functions such as the climate control system, for example. The system requires no memorised commands – the user has the freedom, for example, to phrase the desired destination address or the question about the weather report off-the-cuff. What else is possible now: activating the voice control with the "Hey Mercedes“ prompt. The talk button on the steering wheel is additionally available for this purpose. New features in the GLC are the standard-fit KEYLESS-GO start function using the turbine-look start-stop button and the option to activate driver assistance systems on the multimedia display. The user selects and activates the drive modes via the DYNAMIC SELECT switch on the centre console. The multimedia display shows different drive modes in line with the particular equipment. The driver can select from different pre-configured and one individual drive mode. Depending on the powertrain and the suspension variant, between five and seven drive modes are available. In addition to "Comfort“, "ECO“, "Sport“, "Sport +“ and "Individual“ for customising the steering, the suspension or the powertrain, the Off-Road Engineering Package offers the two modes "Off-Road“ and "Off-Road +“. The GLC will be equipped with the next generation of four-cylinder petrol and diesel engines. The crucial feature of the M 264 two-litre four-cylinder engine from Mercedes-Benz is the increased output at significantly lower fuel consumption. In the GLC 200 and GLC 300, the M 264 four-cylinder engine replaces the M 274 predecessor engine, the OM 654 four-cylinder diesel engine replaces the OM 651 predecessor engine. The new engine generation is of great importance for reducing CO2 emissions and is a systematic advancement with regard to lowering consumption. The main technology components are CAMTRONIC variable valve control, which heats up the exhaust system without driving up consumption, the twin scroll turbocharger and the additional 48-volt system with belt-driven starter- generator. Especially the combination of 48-volt on-board power supply and belt-driven starter-generator increases the agility, improves the comfort characteristics – and significantly lowers the fuel consumption. This is made possible by the system permitting important hybrid functions such as "energy recovery" "boost“ and "sailing mode“ without high-voltage components – to be more specific, boosting, recovering up to 10 kW of energy (in the rev range up to 2500 rpm) and operating in sailing mode with the engine switched off. The most important components of the exhaust gas after treatment system are directly mounted on the engine for efficiently reducing emissions. In addition, measures for heat insulation and further developed coatings such as SCR technology (Selective Catalytic Reduction) cause an additional decrease in emissions. To reduce the nitrogen oxide emissions further under higher loads, the OM 654 is equipped with an additional underfloor SCR catalyst. As a result, the engine today already complies with the RDE (Real Drive Emissions) requirements. The OM 654 four-cylinder diesel engine is combined with 4MATIC all-wheel drive and the 9G-TRONIC automatic transmission, which supports both a dynamic and a fuel-saving driving style. With the model update, the GLC is for the first time equipped with the DYNAMIC BODY CONTROL suspension with infinitely adjustable dampers for the front and rear axle. Depending on the driving situation, speed and condition of the road, the damping is controlled individually for each wheel in interaction with the engine, transmission and steering characteristics. In addition, the suspension can be combined with a sport steering system with a more direct steering ratio. It is operated with the DYNAMIC SELECT switch and offers three selectable stages: The two stages "Sport“ and „Sport +“ deliver a firmer set-up of the damper characteristics, while "Comfort“ mode provides an especially comfortable ride. An SUV that lives up to its name: As usual, the GLC is convincing on almost any type of ground and in the most adverse weather conditions. The new controls of the Off-Road Engineering Package and the DYNAMIC SELECT system with expanded functions according to the specification responds to the individual requests of the driver with regard to the handling and the requirements posed by the particular road conditions. The driver selects between the two off-road drive modes with the DYNAMIC SELECT switch on the centre console: The "Off-Road" mode is particularly suited for dirt roads, gravel, sand and snow, while the "Off-Road +“ mode is perfect for difficult terrain with rocky or steep slopes. The 4MATIC all-wheel drive was newly developed from the ground up. The three-stage design of ESP® with a wider spread now offers even more dynamics in the "Sport“ and "Sport +“ drive modes. The GLC thus once again proves its versatility – off-road as well. When Active Distance Assist DISTRONIC with route-based speed adaptation is activated, the new GLC is able to recognise and respond to traffic jams or slow-moving traffic with the help of information from LiveTraffic before the driver becomes aware of this traffic obstruction. When a traffic jam is detected (and if the driver does not choose a different response), DISTRONIC reduces the speed to around 100 km/h as a precaution. This is complemented by an improved Active Lane Keeping Assist as well as by additional functions of Active Emergency Stop Assist. Active Braking Assist with tail end of traffic jam emergency braking function, turn-off and cross-traffic function reduces the risk of a potential accident when making a turn, for example, if the driver fails to see oncoming vehicles. If there is a danger of a collision with oncoming traffic when making a turn across the road, the GLC can be braked at the speeds typical of such manoeuvres. Braking intervention takes place if the driver signals the intention to make a turn and the vehicle can be braked to a stop before crossing the lane markings. Oncoming vehicles are detected by the long-range radar sensor in the front and the stereo multi-purpose camera. 60 km/h the surroundings as well as detected lane markings. Also possible is the simplified overtaking manoeuvre with activated Active Distance Assist DISTRONIC: When the driver activates the turn indicator at speeds between 80 and 180 km/h on multi-lane roads, Active Lane Change Assist can help with changing lanes. The exit warning function reduces the risk of failing to see an approaching vehicle or a cyclist when opening the door. The exit warning function is only active when the vehicle is stopped. When the driver or a passenger opens the door and a vehicle is approaching, the system emits a visual and audible warning. The function is active for up to three minutes after switching off the engine. In conjunction with the ambient light, the lights of the door handle recess, the map pocket and the trim illumination flashes red in addition. As an option, Active Parking Assist is available. After pushing the button for Active Parking Assist, the system shows all identified parking spaces in the immediate surroundings on the multimedia display at speeds below 35 km/h. The driver selects the parking manoeuvre as such with the touchpad, the touchscreen of the multimedia system or the right-hand control panel of the multifunction steering wheel – the system provides assisted pulling and reversing into and out of a parallel and end-on parking spaces. In combination with Blind Spot Assist, Parking Assist PARKTRONIC can warn the driver of cross-traffic when reversing out of end-on parking spaces, and also initiate automatic braking if necessary. Parking Assist PARKTRONIC gives a visual and acoustic warning of obstacles detected by means of six ultrasound sensors in each bumper. These can be in front of, to the side or behind the vehicle, and are detected at speeds up to approx. 10 km/h. Another highlight is the optional Trailer Manoeuvring Assist, which supports the driver with manoeuvring in reverse. The system uses sensors in the ball head and a magnetic ring to measure the angle between towing vehicle and trailer. The 360-degree camera offers a better all-round view when parking and manoeuvring as well as a virtual bird's-eye view. An additional zoom mode facilitates approaching and hooking up the trailer, the image on the multimedia display features a new animation and the picture quality has been significantly improved. Car-to-X-Communication supports the driver by providing the driver with up-to-date information and warnings of hazardous situations on the road. The radio-based exchange between vehicles as well as between vehicles and the traffic infrastructure informs the driver visually and/or acoustically of potential hazards. The new generation of the GLC marks the start of a new chapter in a true success story: The model sold significantly better than its predecessor in its first full year on the market. At present, Mercedes-Benz has a very successful presence in the SUV segment with seven models (GLA, GLC, GLC Coupé, GLE, GLE Coupé, GLS, G-Class). There is no doubt about it: The SUVs play an essential role in the product range of the brand and its success. More than five million SUVs from Mercedes-Benz were delivered to customers worldwide to date.